Buhle qualified as a Chartered Accountant in 2009. She is an Independent Non-Executive Director at OUTsurance Insurance Company. She is also a member of the Steering Committee for 30% Club Southern Africa. 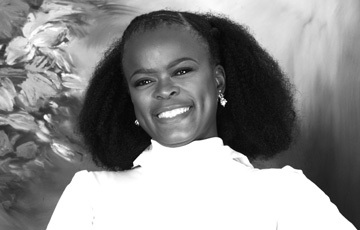 She serves as a non-executive Director at Biodx Biological Chemical Technologies and is a non-executive Director of Windtown SA (Pty) Ltd. Buhle works as a Senior Account Manager at the IDC. Her responsibilities include managing and formulating plausible solutions for distressed clients, and those in business rescue as well as maximizing recovery for the IDC by formulating turnaround strategies and or financial restructurings. Buhle completed an Advanced Course in Business Rescue Practice from the Law Society of South Africa (LSSA). In 2014, she obtained an Advanced Certificate in Insolvency Law and Practice from the University of Johannesburg. She adds immense value to her positions by bringing her astute risk assessment and analytical abilities to the table. After completing her Development Finance Programme from University of Stellenbosch Business School in 2013, she became interested in analysing the common market failures and imperfections identified in emerging economies. As such, in 2014 she obtained an Advanced Certificate in Emerging Markets and Country Risk Analysis at Fordham University in New York, USA.